The Wall Street bank may yank its last humans from the exchange floor. It has also invested in electronic venues like BATS and is a big customer of newcomer IEX, which aims to neutralize high-frequency traders. Goldman’s timing is apt for the latest bout of market scrutiny. 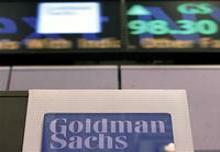 Goldman Sachs is in the process of selling its New York Stock Exchange designated market-maker unit, the Financial Times reported on April 1, citing people familiar with the matter. The Wall Street firm paid $6.5 billion in 2000 to acquire Spear, Leeds & Kellogg, at the time a powerful trading firm. The bank may have lined up a buyer for the unit, which analysts now value at about $30m or less, the FT said. Goldman is the largest broker using IEX, a recently established firm that delays customer orders so as to ensure high-frequency traders cannot front-run order instructions, Bloomberg reported on March 25. IEX features in “Flash Boys,” Michael Lewis’ new book in which he claims high-frequency traders are rigging U.S. equity markets. Goldman was also an investor in Direct Edge, which merged this year with BATS Global Markets, with the combined organization claiming more than 20 percent of U.S. equity market volume.